ed! The unpredictable Tiree weather had us in a predicament for a few days but we finally decided to go with Friday the 4th of November as the day for the event! As usual a terrific crowd came out to enjoy the event, which was a great success! The weather was mostly favourable, but very cold! The crowd were kept warm by lovely food which was provided by An Talla committee, burgers, soup and even some home baking! 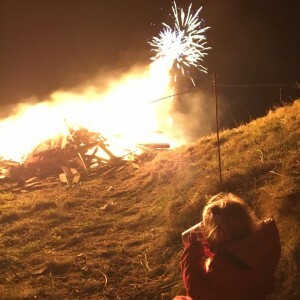 This year we had two excellent Guys prepared by the local Beavers and Sradagan group, and they didn’t take long to disap pear from the top of the bonfire! Andy and Bino provided the entertainment with lively tunes and excellent lights! 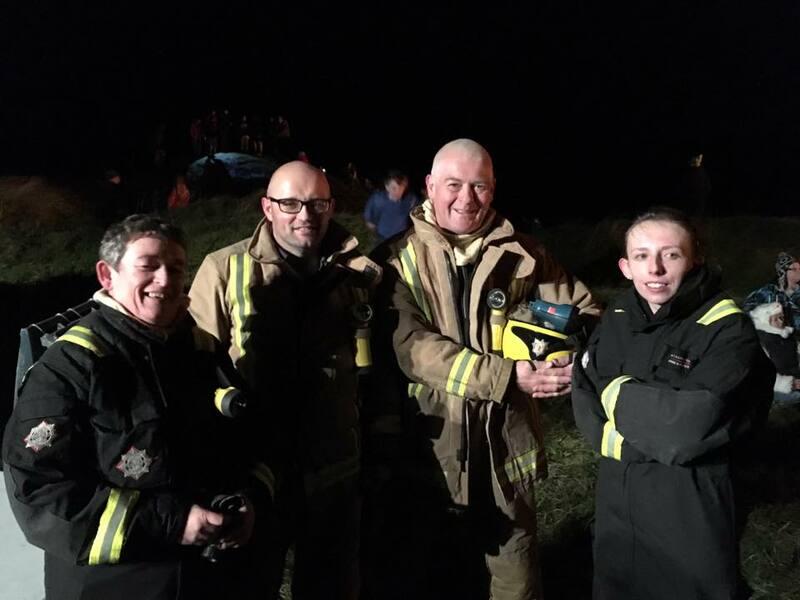 This year we drafted in the expertise of our local voluntary retained fire service who were in charge of setting off the firewor ks! There was a good 15 minute display of spectacular fireworks, that lit up Crossapol bay, creating some stunning scenes! The whole evening had a lovely community feel to it, with a variety of different groups and individuals involved in creating the successful event! In the weeks running up to the event, we were running a bonfire picture competition and the winners were announced on the night. The results are as follows: Under 5: Blyth Wright, Under 10: Annie MacLennan, Under 16: Shanelle Patterson and 16 and over: Frances Khetrat – well done all! We also run a raffle, with the top prize being a return flight for two donated by Loganair, well done to John Bottomley who won this! Tiree Trust would like to thank everybody who came out the event! 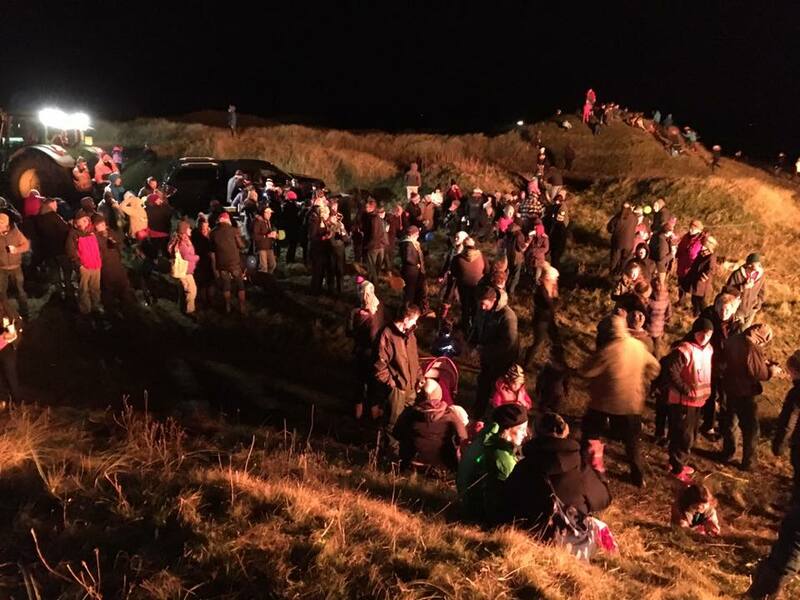 A special thank you to all who donated and transported wood down to the bonfire, to Lachie Brown who built it, to the Crossapol grazing committee for allowing us to hold it in the area, to all of An Talla committee for the lovely spread laid on. Thanks to Andy and Bino for entertaining the crowd, to retained fire service for letting off the fireworks, Cameron Smith for lighting the fire, Andy Phillips for assistance with lights and equipment and to both youth groups who created the excellent guys! Well done to the entire community for putting on another fantastic event!